Monday March 21st 1904 It rained early this morning. Levi Hill came to work so Will let Will Brewer go away. Mollie did not come home for her dinner. I sewed some in the afternoon. Will does not feel very well. Tuesday March 22nd 1904 weather pleasanter. I was busy all forenoon with the work and Will and I went to town in the afternoon. I stopped at home and walked over I was very tired so went to bed early. Wednesday March 23rd 1904 weather still pleasant. I was busy most of the forenoon. I spent a part of the afternoon down at Mrs Ed Kosers and called at Anna Francis. Mollie went down to Fannies to stay all night. 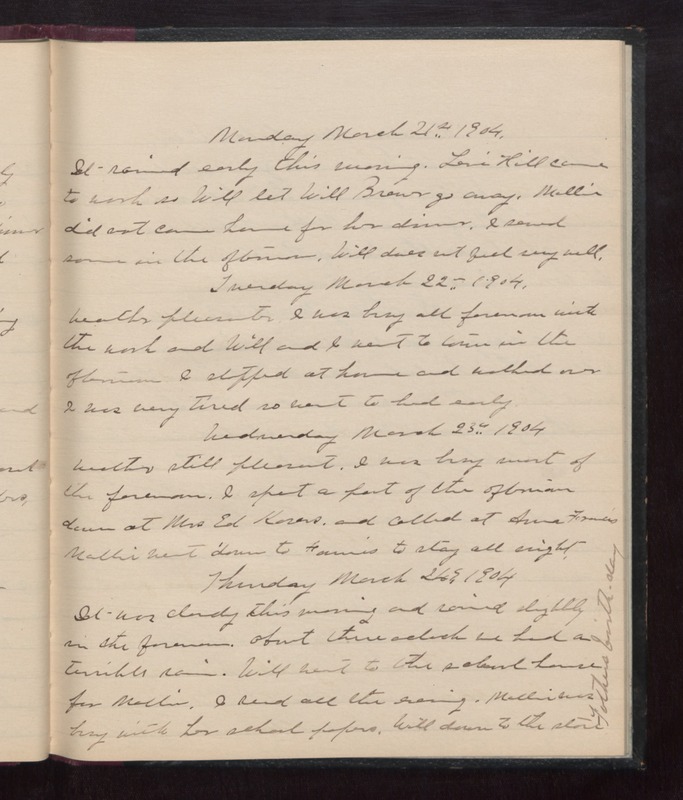 Thursday March 24th 1904 It was cloud this morning and rained slightly in the forenoon. About three oclock we had a terrible rain. Will went to the school house for Mollie. I read all the evening. Mollie was busy with her school papers. Will down to the store. Father's birthday.